Linda Shenton Matchett: Talkshow Thursday: Meet Norma Gail! Linda: Welcome to my blog, Norma Gail. I'm thrilled to introduce you to my followers. I greatly enjoyed your book, Land of My Dreams. Congratulations on publishing your first novel. Where did you find your inspiration for the story? Norma Gail: I have wanted to be a published author since I was a child and read Little Women. Jo March was my hero. Life, a nursing career, kids, all got in the way, but I always said, “Someday.” When I broke my foot and spent 8 weeks in a wheelchair, my boredom led me to start working on a story idea that had been churning in my brain for a couple of years. Once I had it down on paper, I got the courage to attend a writer’s conference and see if I had what it took. I learned a lot and a little over a year later, following my second conference, I had a contract. Norma Gail: Much of the research for Land of My Dreams was done prior to ever sitting down to write. It involved a trip to Scotland for our 30th wedding anniversary. My most interesting research story involves a work in progress. I love history, if it’s family history, I love it more. My great grandfather and great uncle were murdered on their ranch in southwestern New Mexico in 1918. The killers were never brought to justice and I took that very personally. I attended nursing school with the great granddaughter of one of the men involved. We had to agree to disagree and ended up working together for 7 years. Years later, I began researching on the internet and came across cousins who were sisters, also searching. Our mothers met once. Our grandmothers were sisters, but the families lost touch over the years. They came for a visit with another sister and their mom. I rented a Suburban and we went off for a week to see what we could dig up in libraries, newspapers, and the scene of the crime. We are a little closer to the answers, but in the process, I have reunited the descendants of my great grandparent’s eight children who had lost touch with each other. We now communicate regularly, share photographs and some of us have met. I continue to be the principle researcher. I have even talked on the phone to the great grandson of one of the murderers who has many questions of his own. We plan to get together soon and discuss our shared tragedy. He now owns a portion of my great grandfather’s ranch. It is a story begging to be told. Norma Gail: Absolutely a pantster! I plot when I get stuck, but I have to just write and get the story on paper before I can begin to make it flow coherently. I’ve tried plotting first. I find it tedious and boring. Norma Gail: I have two. The first is when Bonny Bryant, an American college professor, teaching in Scotland, goes fly-fishing with Kieran MacDonell, a bagpipe playing, kilt-wearing, Highland games athlete in Scotland. He is a full-time sheep farmer and part-time math professor. My husband played a huge part in writing the scene, and I love the electricity between Bonny and Kieran and the fun they end up having over an event that parallels a true-life fishing experience of my husband. The second would have to be when Kieran takes Bonny to Urquhart Castle, the castle on the shores of Loch Ness. The experience of a very special rainbow is taken from an experience my husband and I had on top of that very castle on our trip to Scotland. For that reason, it holds a very special place in my heart. 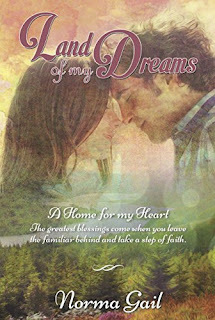 Norma Gail: I am completing the sequel to Land of My Dreams. The tentative title is Within Golden Bands. The characters, one in particular, had their own ideas about how to behave and totally messed with my plans for the story, however, it is shaping up as a pretty exciting romantic suspense. I am loving returning to my beloved characters who have become my dear friends! LM: Now that you’ve published your first book, what advice can you offer for fledgling writers? Norma Gail: Don’t think because you made good grades in school and have always loved writing that you know everything and can write a bestseller on your own. Take time to learn your craft. Attend writing conferences early and often. Take the advice you’re given from critiques, good or bad, and never, never give up! Norma Gail: Teaching the Bible. I recently had to give up the Bible study I led for 13 ½ years, for health reasons. I miss it terribly. My real passion is teaching the Old Testament, especially Genesis, because so many Christians tend to be ignorant of the power of those books. I love Deuteronomy and Leviticus, and helping women develop a biblical worldview. My other passion is family history research. I can get totally carried away with either. Norma Gail: I love romantic fiction, but my favorite Christian author is Michael Phillips. He is not known for romance or light, easy reads. He is known for beautifully woven stories that have deep and powerful Christian lessons. My goal is to write stories that entertain, but also move the reader to examine their lives and relationship to Jesus through the experiences of the characters and grow through their reading. I like fiction with spiritual depth, yet great, heartrending romance. LM: Thank you so much for visiting today! Readers you can find Norma Gail's book Land of My Dreams on Amazon. Thank you for hosting me today, Linda! I really enjoyed your questions! Enjoyed the interview. I really enjoyed Land of My Dreams. Thank you, Ann! I appreciate you taking the time to stop by and leave a comment.